In the world of fashion design, creating a line is the easy part. Yes, I said easy. You see, all the blood, sweat and tears you put into designing those fabulous garments is just a fraction of what it takes to get them from the drawing board to actual customers. Unless you plan on being your only customer, you need to get your line out and noticed, which means having a solid marketing strategy. You need to pound the pavement, get your clothes into a mix of spaces and advertise everywhere. You need to eat, sleep and breathe your line- so consumers will too. In today’s digital age, there are a wide variety of tools to make that happen, and I’m going to tell you all about them. I’ll walk you through the steps you need to take to sell and promote your own Fashion Brand, so your line sits in your customer’s closets- not yours. Before you even think of going around to fashion houses and retail outlets to promote your line, you need to define it. In today’s day and age what sets a brand apart from all the others is the story behind it. Shoppers want to know what your line is all about- and what it’s not. To do this, you need to look at where you plan to market, what your line’s purpose is, who your target market is and what your price points are going to be. After all, if your marketing leisurewear to forty-somethings, you may want to stress your clothing’s durability, where as if your marketing twenty-somethings you may opt to market how well it moves and can go from business to pleasure. Point is, you need a clear idea of who your market is, so they can understand why your line is their best option. Now that you know what your collection stands for, it’s time to get it into the hands of shoppers. One of the best ways to do that is online. Online shopping is the go to for consumers, so setting up a website and store is one of the best ways to make your line accessible. Design it with your customers in mind: the one thing shoppers hate is a difficult site to navigate. Make sure your tabs are clearly defined and garments are easy to find and organized by category. Use professional pictures: when you’re online, pictures will make or break you. Shoppers can’t touch or try on the clothes- your pictures have to do that for them. You need clear pictures of your clothes, from multiple angles and on actual models, so shoppers can get a sense of how the fabrics move and drape. Don’t skimp here! Use a professional photographer to make sure the lighting and angles are right. Expose Yourself: Consumers like to know who they are buying from, so have an about section and tell them why you create clothes and why they should buy from you. Personalizing the experience makes shoppers feel connected to you, which makes them want to buy. Use Local Boutiques: Boutiques are another great way to get your clothes in-stores. These stores are smaller and more intimate, giving you better access to the decision maker (owner), which can help you get your foot in the door. 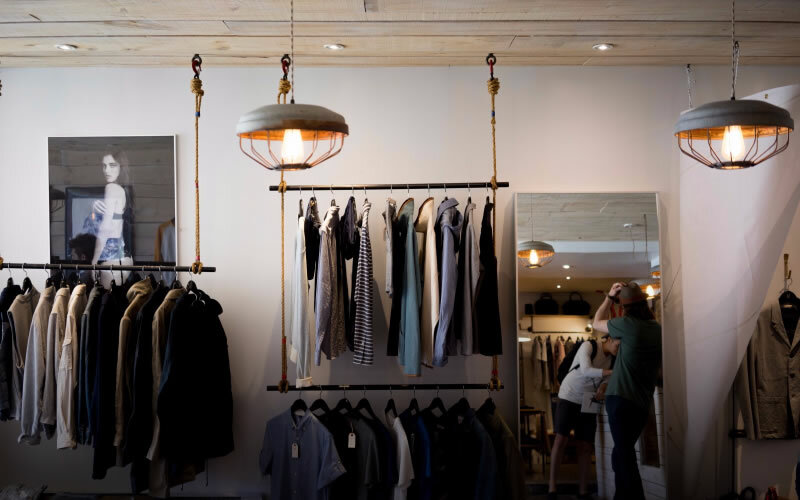 While these stores may hold less than a major retail line, they are usually more approachable and you can forge a real relationship, once again personalizing your pitch to really connect and get them to take a chance on you. Also, if you do well, your line can become the focal part of the store. Sell Using Trunk Shows: For new and budding designers, trunk shows are a great way to get your line noticed and is a win-win for you and the retailer. Retailers win because it requires no commitment from them- they don’t need to buy the pieces, just show them. Third Party Retailers: Online selling sites that let you host home selling parties, like Stella & Dot or Chloe & Isabel. These sites give you an online and in-person presence, along with great guidance and assistance. Just know there are usually start-up costs when joining so weigh your options. Retail Stores: Big name retail stores are great, but not for beginners. It is a very competitive avenue, so don’t attempt to sell there until you are more established. Online: Having more established sites or fashion bloggers run banner ads on their pages is a smart way to get noticed. You will need to set-up an account with an online ad agency, like Marketing 360, which is not expensive, to get started. You can even sell Leather Patch Labels and Custom Hang Tags on the internet. Remember, your ads can run on any site, not just fashion ones, so you can contact online magazines and journals too. You can also send bloggers free samples in exchange for a feature, which many will do, especially if the line is creative and in keeping with their site theme.